Squad: Comes with 10 troops which will move and fire together. Veterancy (if possible) will increase number of them. Can 'try' to block enemy vehicles. Commando: Can attack enemy sneakly, very sneak. Strong but must move slowly. 30% concealed. And must get close to the enemy to attack. Melee attack means instant death. Spy: Gathers information. Can sabotage enemies. 70% concealed. HUMVEE: well, errrr, same as real world humvee. Artillery: Long range, not capable for attacking moving units, high blast radius. Slow projectile. APC: Carries 10 units or one squad. Has firing ports to fire from inside the APC. Has a wheeled and tracked version. The tracked version features a higher price but slower but can destroy light barricades. Mine Layer: Lays mines, choose between AP and AT. AP mines kill people instantly. AT mines will bomb vehicles only. AA Tank: Destroys flying objects. Oh sorry, then. But I had came up with another exoskeleton idea today. They are standing robots (like human) that has a driver and have weapons. How about a catapult-like unit that launches small spider-like robots from afar? Could be a way to try to get some units behind defenses to see what's there, and maybe take something small out. Posted: Thu Feb 17, 2005 8:11 pm Post subject: possible unit ideas. What about this. A unit that alone has almost no defensive capablities, (save for maybe machine guns to fend of infantry) but when a reasonable number of them combine say around 5. From the roofs of all of them pop out these huge tube sections that combine to make a large energy cannon. Combined they have to be able to fit end to end with no elevation difference between them and they couldnt move except for turning slightly to aim. Around a 30 degree to either sidre variance. Other ideas perhaps, a giant mini gun like weapon with ap shells for no real specialty in killing unit types but no real weaknesses either. Since infantry are gonna be nothing but meat, they're gonna take casualties pretty quick. Instead of doing just one infantry unit at a time, a factory produces a "squad" of infantry, say about five. These all count as one unit, no matter how many are left in the squad. You could issue grouping orders, like telling them to tighten up or to fan out, or even to hide and lay in wait behind whatever is nearby. They would be invisible to the normal eye and could ambush anything that passes by either independently or on command. How about a hover bike unit? basically an infantry man on a flying motorbike, would have the same armour stats as a regular infantry but move a lot quicker, be able to fly over water, and be able to carry larger weapons. On the downside, it would be more expensive than regular infantry and possibly be slower going uphill (hovering units have less traction). What about a gun that could either really be applied to whatever unit type you want. And the gun fires canisters that produce huge endothermic reactions. (that means they take heat in lowering ambient temperatures) The gun wouldn't necessarily do high damage to enemies but it would cover them in ice slowing down movement and firing rate. I have a few unit ideas. 1. Assassin: Produces one at a time rather than in squads. 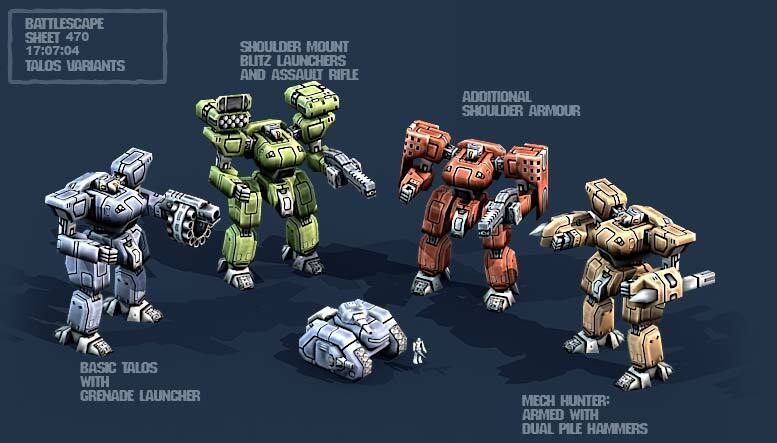 Can become hard to spot if staying in the shadows, carries a heavy sniper rifle effective against infantry any light mechanical units and vehicles. Can only be seen by enemy units if they are facing the assassin, and he comes equipped with a knife for an instant kill on any infantry type unit if attacking from behind. Obviously a more expensive unit. 2. Brawler: A light mechanical unit that can switch between moving on all fours and on its hind legs. On its hind legs it moves extremely fast and can knock over infantry by running into them, but otherwise weak. When on its hind legs, it moves much slower but is devastating in melee combat. Has long claws that can literally tear a tank apart. Its one true weakness is that it can't fight at long range. 3. Shadow Tank: Creates a field around itself that makes all friendly units inside the field invisible to the enemy. Can't attack, and units within the field can't attack. The field can also act as a shield that protects units from gunfire, but for every hit the field takes it weakens and the units hidden by it become slightly more visible. Well, I'm sure I can come up with more, but that's it for now. Well, probably a lot of you guys have played FM4, and it seems that the game`s developers too, since there are some pics of it in the gallery (the one that i chose as well). In less then 10 hours playing (i dont remember exactly when), using the Derik team you get to fight a womam inside a big, spider like mech, with 8 legs, a frontal cannon and a minigun. I just think that idea is perfect, cause it`s a lot easier to move on bad terrain with a lot of legs, and having a many sustentation points assure that the unit can carry a lot of weight, so it could be a transporter or a heavy fighter. Another thing that should have (in my opinion the game would be really cooler with it) would be different types of damage, or in a more cheated way, elements. In FM4 for instance, there is the concussion, the piercing and the fire types of damage. It could have eletrical, by eletricity weapons, radioactive type, maybe earthquake, that would be extremely good to destroy facilities, useful against 2 feet mech and useless for the rest. (Obs. : Those damage types differ on what type of unit does it gets a better or worse damage. For an example, radioactive would be effective againte human troops and maybe some alien as well, eletricity would work in all robots, mechs and ships, but would be easy to counter with shield or an eletromagnetical shield (by the way here is another idea, an eletromanetical field that can deflect bullets, lasers, and can be used by troops or bases but need to recharge). Fire is not the element fire itself, but also explosive, so grenade lanchers would be in this category) <-- big parenthesis. Now an idea for an interesting weapon (probably one at near the end of the game) would be a weapon that somehow uses a dimensional driver to attack enemies, by breaking the dimension itself. i know it's like a big bad *** weapon, but the special effects on something like this would be just beatiful. At least the way i imagine it is like a red vourtex that moves. And of course that there should be troops that use laser pistols. For the airborne units i would base the fighters in starfox and HALO 2, cause they have some strange things flying, some that really doesn't look like they could be in the air, and that's the interesting part of the thing. But i am pretty sure that no matter what are the units to be used in this game, it probably will just be a whole lot cool. I would like an exoskeleton unit, Like the talos, but a lot smaller, and has no front armor except for electro-magnetic shields, Kinda like a heavy weapons person thing. And they'd come out in groups of 3, because their still infantry. Maybe if you had a unit like this, it would disrupt enemy targetting -- say, certain long-range weapons couldn't target any unit near this one, or would have a lower chance of landing hits. Or, your units would appear to jump around a little bit when nearby, because it was scrambling the enemy radar. It would make it hard for them to get an accurate idea of what units you even had. Other units that disrupt communication could be good, too -- say, anti-radio units could make enemy units lose communication with their base, so they defend themselves but don't coordinate with other units to attack. Also consider having units that can spy on, and even sabotage, enemy units. Imagine the look of dismay on the enemy's face when his brand new shiny super-tank gets stuck in reverse and can't get to the battlefield in time to help! Something I don't think i've seen in an RTS is units getting jammed and to simulate your inability to talk to them you cannot select them and they just dig in and sit there. Now, have I never seen that because it makes the player want to tear his hair out or have I never seen it because nobody thought of it until now. Obviously you would need a major downside to the "Jammer" unit or I could see it being very popular.